In the next stunning novel from Pulitzer Prize-winning Julia Keller, following the popular "A Killing in the Hills," a pregnant teenager is found murdered at the bottom of a river. Phone calls before dawn are never good news. And when you're the county's prosecuting attorney, calls from the sheriff are rarely good news, either. So when Bell Elkins picks up the phone she already knows she won't like what she's about to hear, but she's still not prepared for this: 16-year-old Lucinda Trimble's body has been found at the bottom of Bitter River. And Lucinda didn't drown she was dead before her body ever hit the water. With a case like that, Bell knows the coming weeks are going to be tough. But that's not all Bell is coping with these days. Her daughter is now living with Bell's ex-husband, hours away. Sheriff Nick Fogelsong, one of Bell's closest friends, is behaving oddly. Furthermore, a face from her past has resurfaced for reasons Bell can't quite figure. Searching for the truth, both behind Lucinda's murder and behind her own complicated relationships, will lead Bell down a path that might put her very life at risk. In "Bitter River," Pulitzer Prize-winner Julia Keller once again weaves a compelling, haunting mystery against the stark beauty and extreme poverty of a small West Virginia mountain town. JULIA KELLER spent twelve years as a reporter and editor for the Chicago Tribune, where she won a Pulitzer Prize. A recipient of a Nieman Fellowship at Harvard University, she was born in West Virginia and lives in Chicago and Ohio. 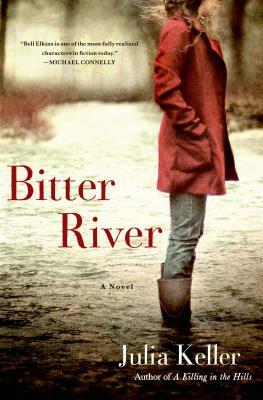 Bitter River is her second adult novel.